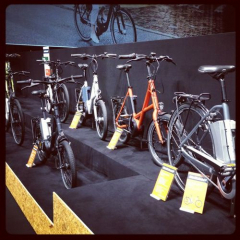 This is a guest report from Brett Thurber, co-owner of The New Wheel electric bike shop in San Francisco, California. Derby Cycles throws one hell of a party. From morning to night, for two weeks, Derby Cycle Werke, the factory and headquarter’s of Germany’s largest bicycle producer and Europe’s largest electric bike manufacturer is transformed from a workaday plant in a tiny town in middle of nowhere Lower Saxony into the second largest bicycle expo in Germany after Eurobike.